WNBA: L.A. Sparks don’t lock up playoff berth falling to Tulsa Shock, 96-90. 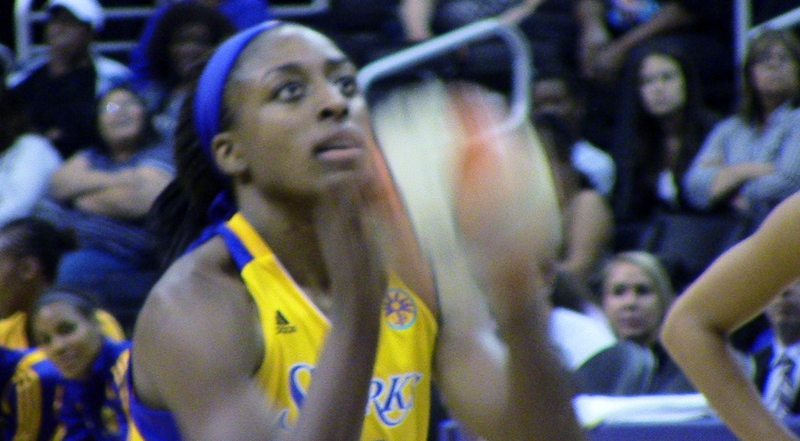 L.A.’s Nneka Ogwumike scored a career-high 35 points in the Sparks 96-90 loss to the Tulsa Shock . LOS ANGELES- Riding their best stretch of the season having won four-of-five games coming into Tuesday’s game the Los Angeles Sparks took a small step backwards falling to the Tulsa Shock, 96-90 at Staples Center. A win over the Shock would’ve clinched a Western Conference playoff spot but now Los Angeles will have to wait. And when you consider the Shock were 3-10 on the road entering Tuesday’s game, it certainly was an opportunity lost. Also lost were the performances of forwards Nneka Ogwumike and Candace Parker. Ogwumike knocked down a career-high 35 points and Parker poured in 28 points to go along with nine assists. Rebounding stats were few and far between for Los Angeles which was out-rebounded 37-17 including 16 to 3 on the offensive glass. After coming back from a nine-point deficit in the first quarter and trailing by six at the half, the Sparks took a two-point lead at the end of the third quarter, 68-66. Los Angeles only scored two points in the first four-and-a-half minutes of the fourth quarter while Tulsa scored 14 to take the lead for good basically putting the game away. Odyssey Sims drained 15 of her team-high 30 points in the frame. Rebounding was the key for the Shock limiting L.A. to one shot at its end while the Shock grabbed rebounds and pushed the action in the other direction. To hear more from Parker, Nneka Ogwumike and L.A. head coach Penny Toler, click on the video with this story. The Sparks had no one else in double figures. Glory Johnson and Skylar Wiggins each added 18 points apiece for the winners. Currently sitting in the fourth and final playoff spot in the west, a win in any of the last five regular season games for the Sparks punches their post-season ticket. L.A.’s next opportunity comes at home Friday night against the Eastern Conference’s top seed, the Atlanta Dream. tip-off is set for 7:30pm PDT at Staples Center. Candace Parker looks to lead the L.A. Sparks back into the playoffs with a win tonight over the Tulsa Shock at Staples Center. LOS ANGELES – A win tonight over the Tulsa Shock at Staples Center and the Los Angeles Sparks secure a playoff berth for the third straight season. Los Angeles (13-15) currently sits as the third seed in the Western Conference with five games left in the regular season. A win tonight over Tulsa (10-19) gives the Sparks a four-and-a-half game lead with four games left. It seems the Sparks are getting hot at the right time winning four of their last five games going into the final two weeks of the season. Sunday’s dramatic 70-69 win at Staples over the Connecticut Sun looks as if it’s provided, ahem, a Spark for Los Angeles. Trailing by six points with 29 seconds left in the game, the Sparks scored seven straight points thanks to some superior pressure defense culminating when Nneka Ogwumike stole and inbounds pass getting the rock to Candace Wiggins who found Kristi Toliver for an open three-pointer with nine seconds left putting the Sparks ahead for good. When you consider Toliver had been 0-for-6 from the field up until that clinching three went in, she was obviously clutch when she had to be. Alana Beard had a team-high 18 points while Candace Parker scored nine after missing a couple of games with a left knee strain. Tulsa can still make the playoffs even with a loss to the Sparks. Coming in they trail San Antonio by three games with five left. The Shock’s problem is the finish the season with four of their five games on the road – including tonight’s game in Los Angeles – where they’re 3-and-10 away from home. Tip-off from Staples Center is set for 7:40 pm. 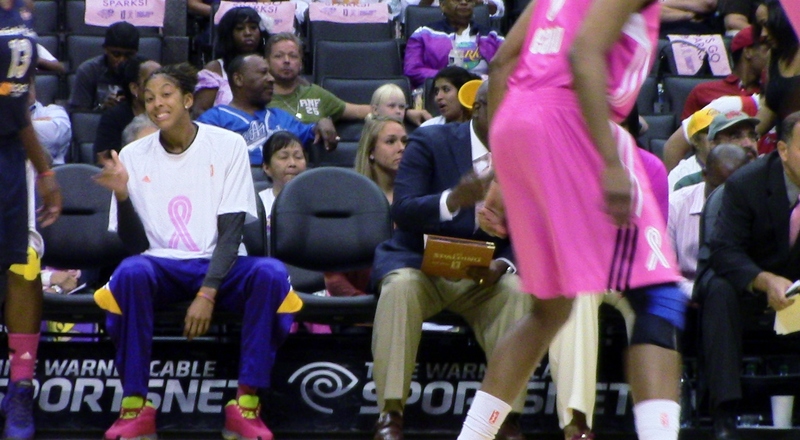 Candace Parker sits with a strained left knee. Sparks beat Indiana, 77-73. Sparks star Candace Parker, sidelined with a strained left knee, grimaces during L.A.’s 77-73 win over Indiana Monday night at Staples Center. LOS ANGELES – Suffering from a strained left knee that’s hampered her since just before the All-Star break, Sparks leader and reigning WNBA MVP Candace Parker couldn’t go Monday night at Staples Center against the Indiana Fever. Los Angeles responded as Nneka Ogwumike led four starters in double figures pouring in a game-high 21 points to go with eight rebounds in the Sparks’ 77-73 win over Indiana. Wearing pink uniforms for Breast Cancer Awareness Night the Sparks (12-14) recorded a second straight win and broke a five-game home losing streak. Los Angeles’ last home win was a 90-83 victory over Chicago way back on July 1st. The decision to sit Parker for the entire game actually came from Parker herself saying she couldn’t go after testing the knee during pre-game warm-ups. Sparks vice president, general manager and now head coach Penny Toler – who took over the coaching reigns after relieving Carol Ross of her head coaching duties on July 20th – agreed with her star keeping her in uniform and on the bench for the entire ballgame. The L.A. Sparks wore pink uniforms in Monday’s 77-73 win over Indiana at Staples Center for Breast Cancer Awareness Night. Since taking over, Toler has now guided L.A. to two straight wins after opening with two straight losses. To hear from Toler, Ogwumike and guard Alana Beard on the importance of breaking that home losing skid, click on the video below for their post game video comments. There were 16 lead changes in the ballgame. The key was a second quarter where L.A. only allowed the Fever (12-14) to score eight points holding Indiana to 4-for-14 from the floor – a 29% shooting clip – while the Sparks shot 59% in the frame hitting 7-of-12 from the field registering 20 points and grabbing a 35-31 halftime lead. Nine-time WNBA all-star and three-time Olympic Gold medalist Tameka Catchings led Indiana with 16 points in the loss. Erlana Larkins registered a double-double in a losing effort with 10 points and 10 boards. The Sparks got great efforts from all their starters. Guard Alana Beard registered 17 points to go along with seven rebounds and six assists. Jantel Lavender added 13 points. Kristi Tolliver had 10 and Armentie Harrington – getting the start in place of Parker – finished with nine and 10 rebounds. The Sparks currently hold the fourth and final playoff spot in the western conference with eight games remaining in the regular season. if the season ended today they’d have a first-round match-up with Britney Griner and the west’s top team – the Phoenix Mercury – who have won all three regular season games against L.A. so far. Barring a severely sore left knee, Parker will be back in the line-up Tuesday night when they head to the Valley of the Sun for the final regular season game with Griner and the Mercury. A win in that final match-up in Phoenix would give L.A. its second three-game win streak of the season and go a long way confidence-wise heading into a playoff series against the Mercury. Tip-off is set for 7pm in Phoenix. Candace Parker out with left knee strain. L.A. Sparks host Indiana Fever tonight. LOS ANGELES – Clinging to the 4th and final playoff spot in the WNBA Western Conference the L.A. Sparks (11-14) host the Indiana Fever (12-13) tonight at Staples Center. Sparks leader Candace Parker is on the bench with a left knee strain against the Indiana Fever tonight at Staples Center. They’ll have to end a five-game home losing streak without the services of defending league MVP and Sparks leading scorer Candace Parker who is out with a left knee strain that’s been nagging her since the All-Star break two weeks ago. The Sparks will be wearing pink uniforms for Breast Cancer Awareness and Health Night. Since Carol Ross was relieved of her coaching duties July 20th and replaced by Vice President and GM Penny Toler, the Sparks have lost tow of three finally getting into that win column with a 77-69 win in Seattle over the Storm for their 4th straight road win. One of those four straight road wins came in Indianapolis with the Sparks recording 86-78 win over the Fever. Parker registered a season-high 34 points in the win, her 11th career 30+ point regular season game. Sparks guard Kristi Tolliver knocked down three three-pointers on her way to 22 points in the win at Indiana. When Tolliver hits two or more three-pointers the Sparks are 5-4. With nine games left in the regular season, Los Angeles holds a two-and-a-half game lead over the Tulsa Shock for the 4th and final playoff spot. 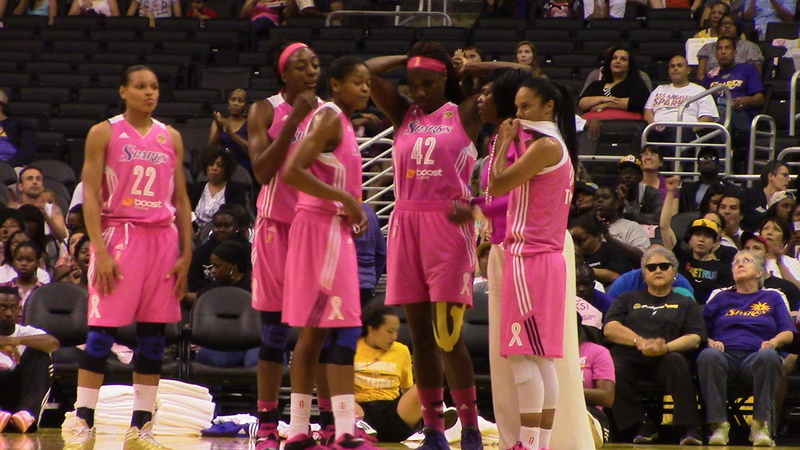 The Fever are led by nine-time WNBA All-Star and three-time Olympic Gold Medalist Tameka Catchings. She’s the league’s active career leader in rebounds, steals, free throws and double-doubles. Catchings is second among active leaders in scoring and block shots. Through the last eight games Catchings is averaging 16 points and seven rebounds notching 20 points in five of those eight games. Indiana’s coming off of a 75-68 win over the Silver Stars in San Antonio Friday night. Tip-off for tonight’s game is set for 7:40. Sparks thrilled to still call L.A. home open at Staples against Phoenix tonight. Sparks’ newcomer Candice Wiggins is banking on her million-dollar smile and jump shot to help L.A. win another WNBA Title. LOS ANGELES – The WNBA’s Los Angeles Sparks tipped off their season Friday night with an 80-69 win in Seattle over the Storm. The Sparks were led by defending league MVP Candace Parker who poured in 18 points. 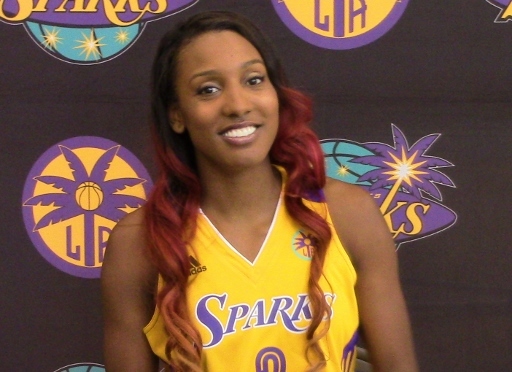 Alana Beard added 17 for L.A.
For a time, it looked as if the Sparks would be in Oakland or San Francisco after the previous ownership group had to let go of the franchise because the group couldn’t handle the financial burden any longer.